When it comes to hauling out holiday décor, it might seem untraditional to opt for blue rather than green, or brown instead of red, but if you want to change things up this season, try experimenting with one of these color add-ins. If you love a traditional, classic take, add brown accents to your natural green décor. The earthy color brings an elegant look to seasonal decorations, blending especially well with wood and neutral tones for a sophisticated look. Get the little ones excited about decorating with a pink palette; thanks to its explosion of color, this kid-approved combination is an unexpected treat when paired with green, silver or blue. Alternatively, keep it subtle with a softer shade of pink or pair with silver for a vintage-inspired look. Let your tropical vacationing vibe inspire this palette. If you’re not excited about adding fruit to your tree, get the same feel with orange or yellow details. Use round, citrus-toned ornaments to fill a glass jar, or oranges with clove for a centerpiece. Bright and cheerful, yellow can serve as a youthful addition to a white holiday interior or a flocked tree. The golden glow from holiday lights may be just enough for you; or, for some extra flair, add yellow tinsel. For those who just can’t seem to kick red and green—which is understandable—use lime for a contemporary twist. The zingy hue can provide just the right amount of lift for the holiday season. Add some character to your December designs by bringing in royal blue. This bright, vibrant color complements the red details you may already have and gives holiday decorations a fresh, playful feel. Regardless of the time of year, navy is practically a neutral and goes well with anything, including holiday decorations. Mix it with a bit of silver or gold sparkle and white accents for a clean, crisp look. 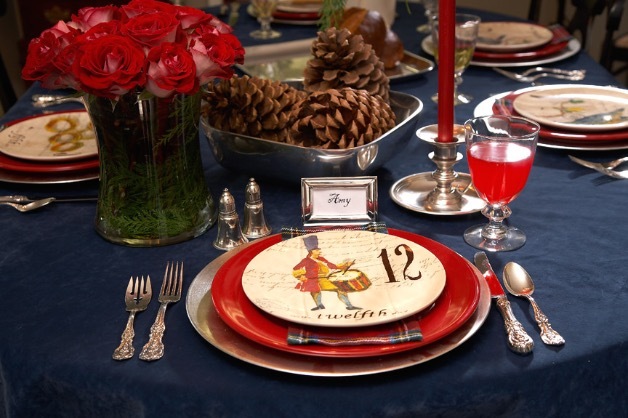 For a more casual look, use a dark denim tablecloth for the holiday dinner, navy ribbon to tie up birch branches or evergreen boughs to welcome guests. Purple has long been known as the color of royalty, so bring a regal touch to your holiday décor by mixing it with red, white or chocolate brown. Dark purple makes the red stand out and is an especially great option in a room full of wood. This rich, elegant color brings sparkle to any room, and especially shines when you include lights. Avoid an over-stimulating holiday season by opting for the clean, fresh look of white and silver. Liven up this light pair with texture from glittery accessories and mercury glass. If you just can’t decide on a color scheme, why not integrate a few? Make it eclectic, playful and tell a story of your holidays past and present.